Whether it’s the seasons changing or the prospect of Thanksgiving company, it’s satisfying to add some style and personality to your rooms. 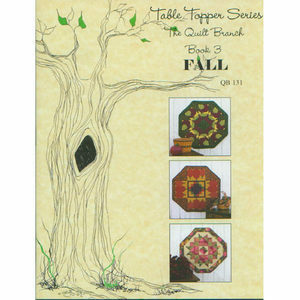 Table runners and table toppers are an easy way to do that. 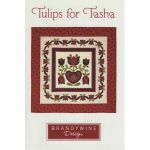 They are usually quick projects and you can make a second one to use as a hostess gift. 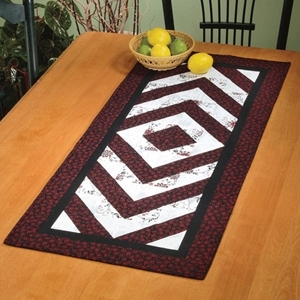 Dining Delight by D. Hall Designs comes with instructions for different sizes so you can choose the length you want. The design is fairly simple, with just a few pieces, but the on-point setting and the pointed ends add interest. 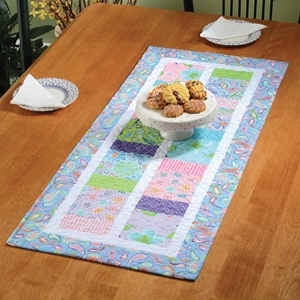 Table Dressings by Nelly of Artela Quilts is made of just a few large pieces. Nelly’s directions are clear and easy to follow. 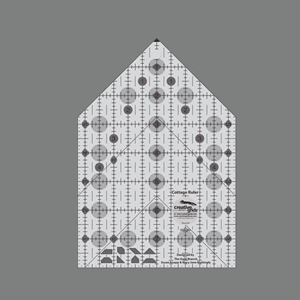 This pattern is perfect for showcasing a favorite medium to large scale print. 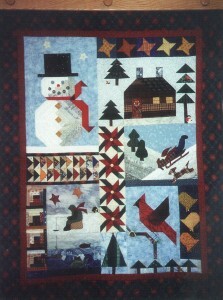 And, bonus, it’s reversible! 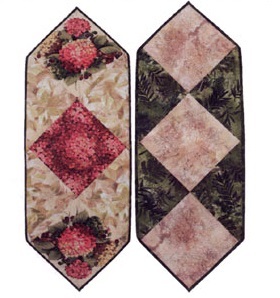 Two table runners in one! Two gifts in one! This one, Swing It!, looks a little complicated, but it’s not as hard as you might think! 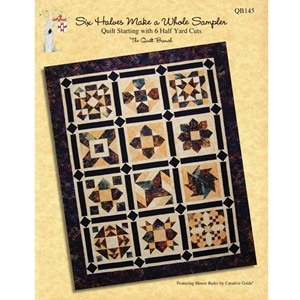 Designs to Share With You has an easy quilt-as-you-go method for curves. So, sew one up, and learn a new technique. 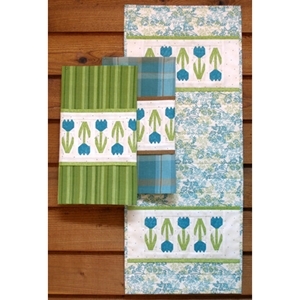 Table Talk is a fun little table runner with lots of visual interest. You could rotate that center block a quarter turn and it would look like the dark blocks are tumbling down, back and forth, from top to bottom. 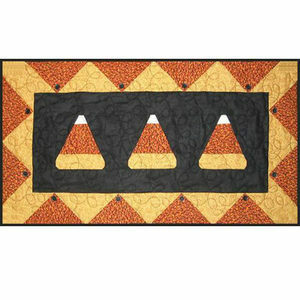 The Roulette table topper uses off center log cabin blocks to create the illusion of curves. 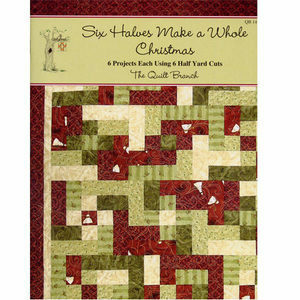 Designer Genii Lehmann says it looks great if you use 4 color gradations in one color family. I agree! 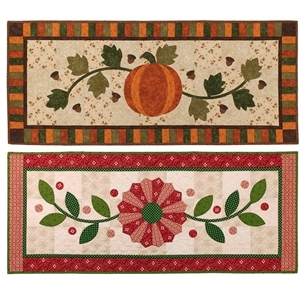 There are many more table runner patterns. 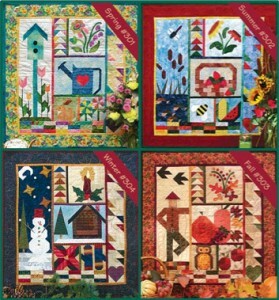 Choose one or two and start stitching. 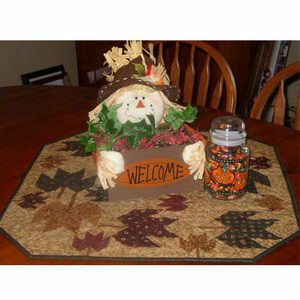 You’ll be dressing up your tables before you know it! 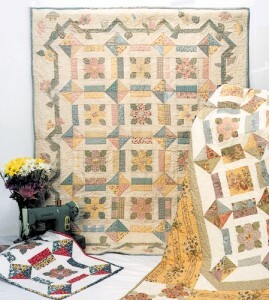 Susan Michaels of Dragonfly Fiberart has been exploring fibers of some sort since she was a young child. 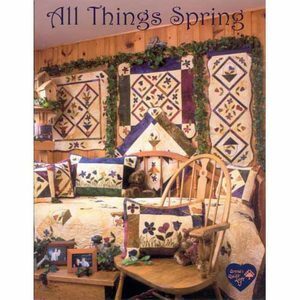 Although she won’t steer away from unusual materials, Susan considers herself to have more of a traditional aesthetic. 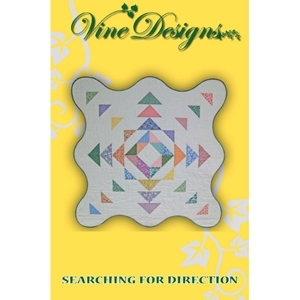 She focuses on “fast and fabulous designs for the creative spirits tight on time”. 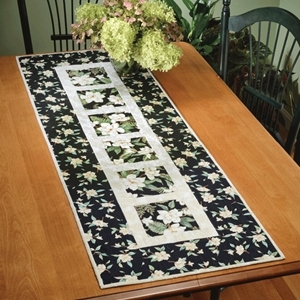 The Bracket Brigade table runner would look great on a dining room table. 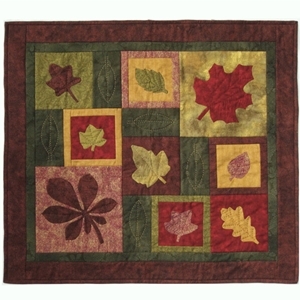 The lines of the quilt design would frame a centerpiece nicely. 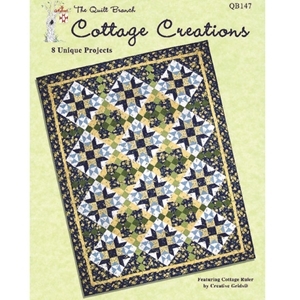 This fat quarter friendly pattern features row construction for a quick finish. 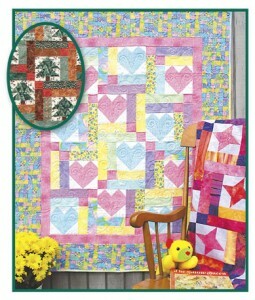 Day Stripper, a quilt-as-you-go project, will make good use of your favorite strippy scraps. 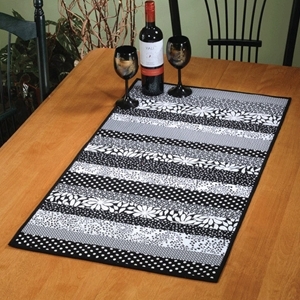 The pattern finishes at 20″ x 37″ but the size is easily adjusted to fit your needs. 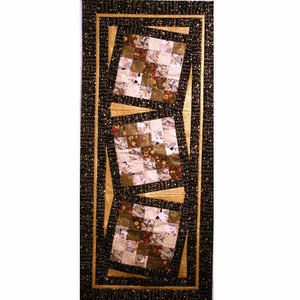 Garden Path will showcase your favorite large scale print. 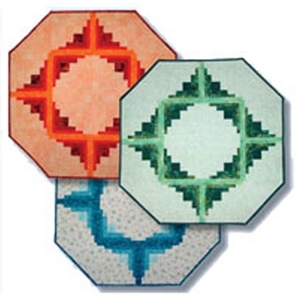 Another option might be to use a few charms for the center blocks. 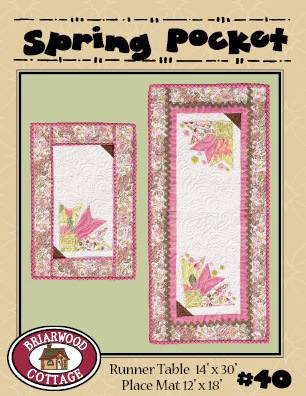 Finishing at 19.5″ x 57″, this is another easily adjusted pattern for just the size you want or need. 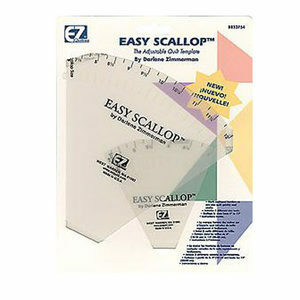 And speaking of charms, How Charming To Sew You is a great pattern for charms. Finished size is 17″ x 40″. 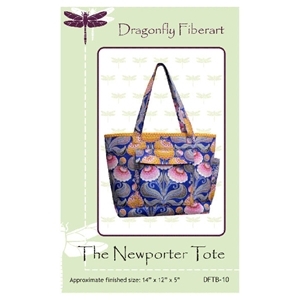 Dragonfly Fiberart also offers a couple bag patterns. With five interior pockets and two exterior pockets, Newporter Tote will keep all of your day’s needs organized . . . .no fumbling! 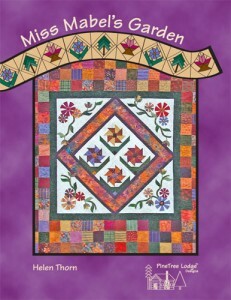 Browse all of Dragonfly Fiberart patterns to find just the right one (or more!) for you.